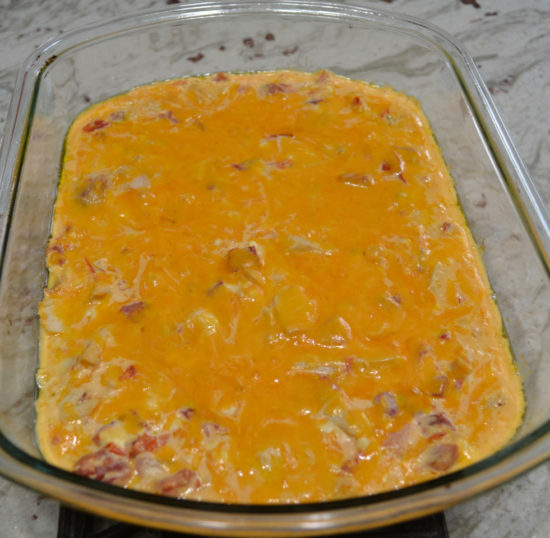 This Cheesy Chicken Enchilada Dip is perfect to serve on game day or any other get together. 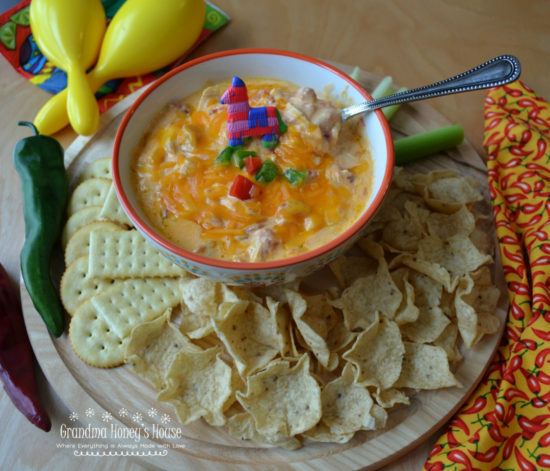 It is a creamy, hot dip, loaded with cheeses, chicken, and a hit of spicy heat. Football games always call for lots of snacks. This past weekend there were playoff football games on Saturday and Sunday. 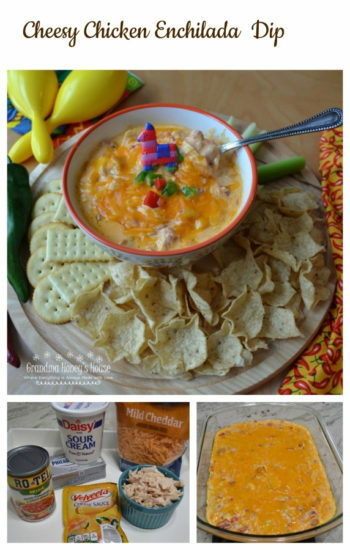 One of our favorite go to dips is the Rotel-Velveeta dip, but we were snowed in and I didn’t have any Velveeta. After scanning through my pantry, I found a packet of Velveeta Cheese Sauce, so a cheesy dip idea started forming. Here are the ingredients I used as the base of the dip. In a large mixing bowl, combine softened cream cheese and sour cream, using an electric mixer. Stir in the Rotel, cheese packet, chicken, and half of the shredded cheese. Add 1/4 teaspoon red pepper flakes, 1/4 teaspoon cumin, and 1/2 diced jalapeno. Spray a 2 quart baking dish with no stick cooking spray. Spread the mixture into dish, top with remaining cheese. Bake @ 350 degrees for about 20-25 minutes or until bubbly and cheese is melted. 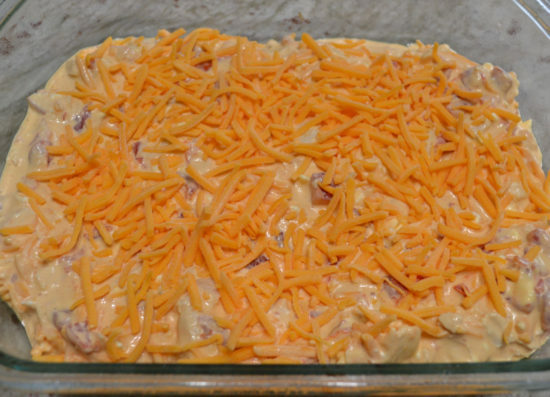 This dip can be assembled a day ahead of time and baked when you are ready to serve. I used rotisserie chicken that I had in refrigerator. This is so convenient. 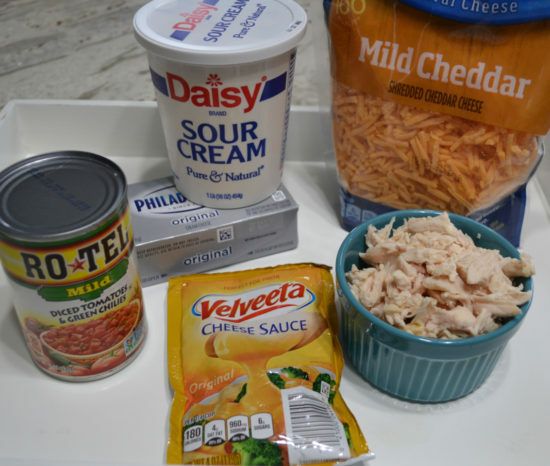 Serve the Cheesy Chicken Enchilada Dip with celery, breads, crackers or corn chips. We love Scoops! This dip was wonderful reheated the next day also. In a large mixing bowl, using an electric mixer, beat the cream cheese and sour cream together until combined. Add the Rotel, Velveeta cheese sauce,1/2 cup shredded cheese,red pepper, cumin, jalapeno, and chicken. Save back a little of the green onion for garnish, add remaining amount to bowl. Stir to combine all ingredients well. Spray a 2 quart baking dish with no stick cooking spray. Spread the mixture evenly into dish. Top with the remaining shredded cheese. Preheat oven to 350 degrees prior to baking. Bake for 20-25 minutes, or until mixture is bubbly and cheese is melted. Serve with crackers, corn chips, celery, or small party breads. *This is not a sponsored post. The products used are my choice and the opinions are 100% my own. 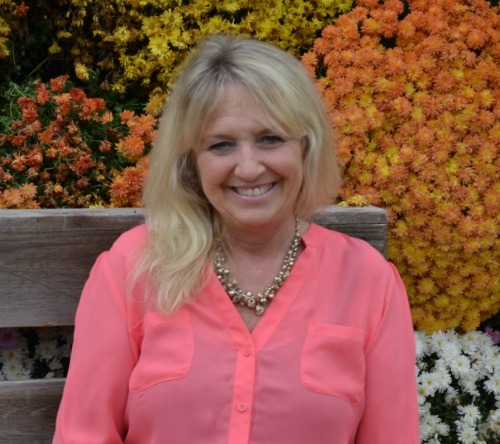 Thank you Susan. You are always so sweet.